Currency movements are impacted by a variety of factors, including interest rates, trade balances, inflation levels, monetary and fiscal policies, and the political climate. Traders use both fundamental data and a variety of technical tools to trade within this market. Inside the Currency Market describes both the underlying dynamics that drive this market and the strategies that can help you capture consistent profits in it. 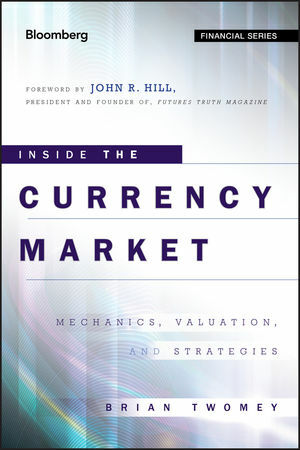 Page by page, this reliable guide skillfully discusses the structure of the market, its roles in the global economy, the forces that drive currency values, trading strategies, and tactics. It also offers a detailed understanding of how global financial flows, derivatives, and other markets such as oil and gold impact currencies. Along the way, author and professor Brian Twomey provides information on gathering and analyzing global financial data so that traders can gain a "big-picture" perspective when attempting to identify trades. The currency market continues to generate interest and attract new retail traders due to the many opportunities available within it. This book will show you how to successfully operate within this arena by making the most informed trading decisions possible. BRIAN TWOMEY is an independent trader and a prolific writer on trading, having authored over sixty articles in Technical Analysis of Stocks & Commodities and Investopedia. His article on Welles Wilder is one of the most heavily accessed pieces in Technical Analysis of Stocks & Commodities in recent years. Through his writings, Twomey has established a strong following among traders and market analysts. He is an Adjunct Professor of Politics at Gardner-Webb University. Twomey has a BA in journalism and a master's in political science and public administration from the University of Central Florida.